Every year we try to plant a garden, of some sort or other. Some years we’ve had flourishing garden, picking veges and flowers, other years barely anything at all. Some years it’s determined by the floods or the lack of water. I’ve done a lot of hand watering, carrying buckets from the creek to the garden over the years (especially when we first moved here to this land, and didn’t have water plumbed in yet). Some years I’ve watched all the soil and the plants washed away by a giant flood. Or the seedlings eaten by possums or wallabies, or the fruits picked off by bush turkeys. But this year I have this. Three raised beds (metal frames) and a raised no-dig garden bed. And a whole lot of flowers that are blooming and thriving - despite our low-quality soil, but perhaps due to all the love and watering and conversations I am having with the little plants. The dahlia tubers were gifted to me, from my dear sister-in-law and also a dear woman who I met recently, and makes magic with flowers. The cosmos keep getting taller and taller, and gifting us new blooms each morning. The tomatoes have grown past the bamboo teepees we built for them, and are giving us sweet little pops of deliciousness every day at the moment. Having a small space right outside out home, that I can see from my kitchen window, makes me so so happy. The pure joy and pleasure of waking each morning, to water or tend or talk to my plants begins my day with a nourishment and uplifting feeling of possibility. We planted more seeds this week past, including some woad and indigo. Next year my dye garden, flower garden and even perhaps vege garden will grow and expand. But for now it’s helping me to grow and expand, to nourish myself in simple small slow ways. My garden, for me, is a very visual representation of the way we can feel about ourselves and the world, and how we can respond and react. Tending baby seedlings is like tending to the creativity inside us, the more we watch, water, talk to, nourish, spend time with the better the plants grow. Same as giving yourself the permission to nourish your self - giving yourself good soil (materials or time or simply kind words), and time. Watering a garden everyday is necessary in our climate here. When I’m watering, I’m also watching for weeds or bugs that might each the plants. If I spend time with my creative practice, I am noticing the things that guide me towards blooming more openly, more rawly. I can start to spot when something is wilting or something is getting ready to bloom. Tending weeds, in the garden, or choosing to pull them up is a lesson, for me, in allowing things. Some weeds are good (especially for my dye pots), whereas other weeds I don’t want to encourage at all. If I encourage weeds in my creativity I have to look at what they’re bringing to me - do they nourish my soil in a way I might not have imagined, but actually need. Or are the weeds taking away from other things growing more happily. So.. looking at this - letting some plants develop is like letting some ideas develop and grow. Pulling a weed out is like saying no to the wrong things in my life. You can choose, in life, in creativity, in the garden, to be happy and content with one small simple garden bed and help it to grow and bloom. Or you can wish for more, constantly spreading yourself thing tending many things, many garden beds… and nothing quite blooms the way it could. GO plant some seeds. A tiny pot is all you need. Some herbs or flowers. Sometimes to bring a joyful feeling when you water it, watch it, pick from it, eat from it. Plant a herb pot to gift to someone else, or a little patch of sunflowers. I’ll be sharing my new dye garden journey over the coming year - from seedling to plant, to the colours they make on my fabric… but for now I wanted to share these photos of our little garden and this tumble down tea-house that will one day be a studio space, and extra bedrooms for my kids. PS - If you’re looking for some books* to help in your garden… these ones are on my book shelf, and I refer to them often - for different reasons. I’ll do a separate review of them in the coming weeks, if you’re interested. Milkwood by Kirsten Bradley & Nick Ritat - so much excellent info about tomato growing, as well as foraging, wild foods, seaweed, mushroom growing and bee-keeping. I can’t wait to see what their next book might be about. Grown & Gathered by Matt Purbrick & Lentil Purbrick - this book has SO much info about gardening, growing, eating locally. Floret by Erin Benzakein - I am referring to this regularly at the moment. Mostly to work out at what stage of bloom should I pick a certain flower, and how best to help it last longer in the vase. A beautiful book for any flower grower. If you purchase through these links I receive a small commission from Book Depository. It doesn’t cost you any extra, it simply means a small contribution to my family income - which can go towards paying my internet bills. I thank you for your support. 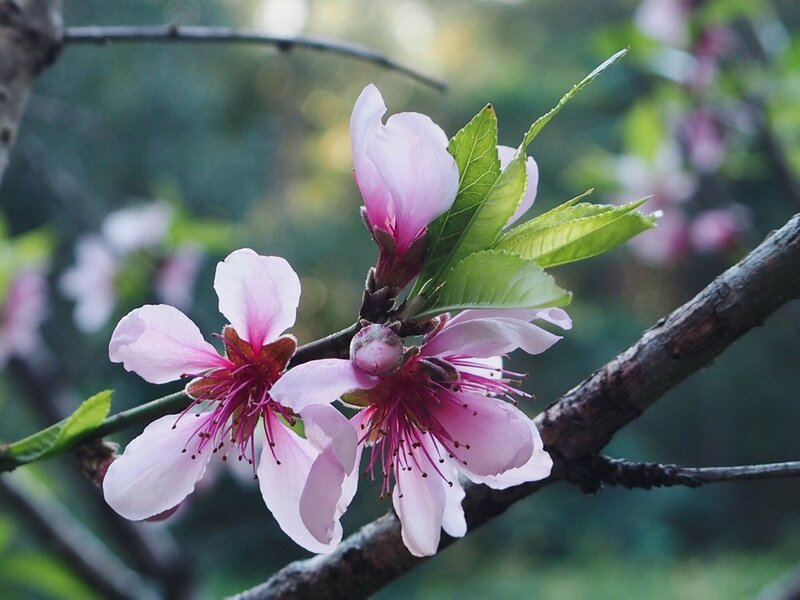 The peach blossoms seem to be bigger and more showy this year. I wonder if it's true, or if my mind is just so wonderfully excited to be seeing them again. These are the prettiest thing in our garden. The trees make me happy all year around, but when the bare Winter branches break into bud and then bloom. Oh oh. So beautiful. These have been flowering bit by bit slowly over the whole of Winter, due to our funny weather at the moment. One tree in the garden - in a different section - hasn't yet bloomed and is still a week or two away. Which is lovely, having the blooms staggered. Oh yes. Loving this more than I can say. And the white plum blossoms will bloom soon - on they are magical indeed. I'm loving Winter, but Spring really is on the way... or some days it feels like it's already here. We found the jasmine flowering behind the water tank. She said, can we make a crown. Of course of course. A Spring crown for my little forest fairy. Welcoming Spring. With her smile. I couldn't choose just one favourite from the 200-odd photos that I took. We were chasing the last of the afternoon light, but the garden looks glowing and glorious in the last days of Winter when we shot these. Jasmine makes me think of our wedding day. Last week we celebrated our nine year wedding anniversary. Our flower girl, so young back then, wore jasmine in her hair and twirled around her flower basket. We cut the flowers from the house up the road from where we were living at the time. I'm so glad there's jasmine here now, on this land. That my mum planted it, despite it being a bad weed that will want to creep over everything, it hasn't been too bad in the years since it was planted. It's good to have that perfume of jasmine mingling with citrus blossoms filling the air. If you are welcoming Autumn, I hope it's lovely watching the leaves change colour and fall and scatter on the ground. The blossoms aren't last long here, it seems Spring will be fleeting and Summer will be upon us before we know it. Right now, I am soaking up every single moment of early Spring flowers as I can. Check out my IG feed, there seems to be a flower every second photo! We've been having some glorious days lately, as well as some rain and cloudy days. But I'm taking notice of the Winter sunshine warming my body and soul, and also tricking a lot of flowers into early bloom. 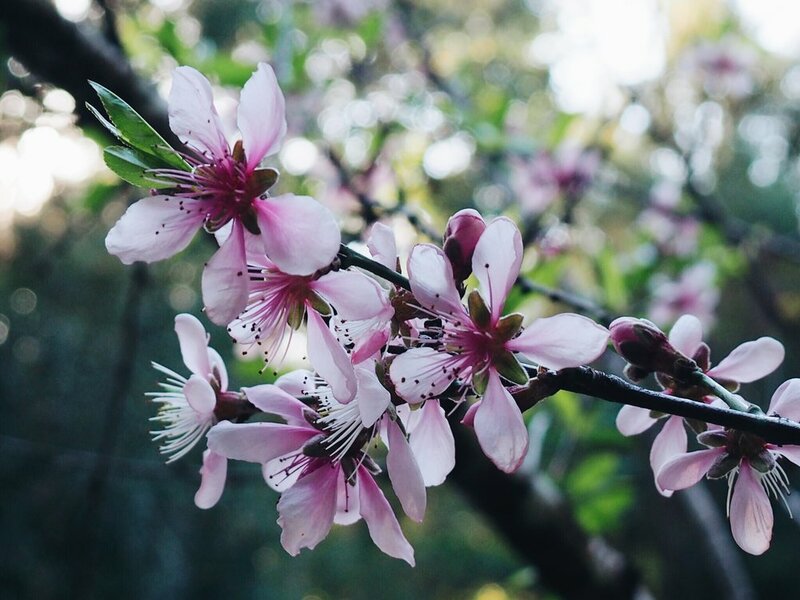 Our peach blossoms are already in full flourish, and their leaves have some on too. Generally the leaves don't come back - with their iridescent green showyness - until some time closer to Spring. The mulberry tree down the road already has tiny little fruits starting to grow. It was full Summer last year when we were enjoying their deliciousness - it was dyeing our hands, feet, mouths brightest purple. And while I can't wait to start dyeing fabric and yarn with those little bubbles of colour, I also don't want to rush the Summer heat too soon. Living where we do, we always have some flowers in bloom over Winter. Our garden is bare and barren, or snow covered like other Winter's across the globe. Nope, the sub-tropics are pretty decent places for Winter. Yet still, to see this early-Spring happening at barely the middle of Winter, means that Summer will be here before we know it. I have a horrible feeling that Spring will pass us by all too quickly and be swallowed up by Summer. And based on the past two years - it'll be wet and hot and steamy. Oh fun. So right now, I'm enjoying these Winter (ish) days, and the feeling of Spring in the air. The days are still short, which means we chase the sun across our yard and I aim for my afternoon cup of tea to coincide with the golden hour before setting sun. (It tricked me today, as the shift in earth meant a different tall tree shaded the final sunbeams and I lost the light earlier than anticipated. Ah those tall trees that block my final cup of tea in the sunshine!!! ).